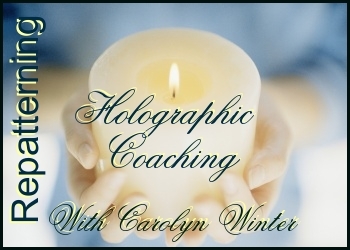 Carolyn Winter is an internationally-recognized certified practitioner of Holographic Repatterning who has been working with the discipline for over 11 years. 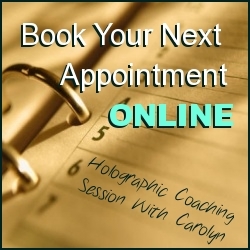 Also known as Resonance Repatterning, its applications are open to creative license; Carolyn’s unique approach includes the coordination of online group proxy sessions, a form of interactive long distance healing in which participants work in virtual or nonlinear time (at their own pace). As someone who employs a wide range of healing modalities, she believes strongly that what works for one person may not work for another; that the expression of healing is highly individual, and that the tools called for must be shaped accordingly. Carolyn’s educational background is in Human Development, a well regarded field that involves the holistic study of family life and healthy communities. She received her Bachelor of Applied Science Degree from the University of Guelph, where she majored in Child Studies. Her particular pride, however, is in studying a version of the Resonance Repatterning system called Healing the Family Systems, developed by Carin Block and drawn from the work of the luminary Bert Hellinger. Often motivated by hands-on, practical means to problem solving and community building, Carolyn found her place as executive director in the social service field, dedicating 20 years to not-for-profit agencies before moving on to her current profession. A solid leader with a flair for organizational re-visioning, she focused her expertise in areas of funding, public relations, strategic planning and community outreach, doing what she could to help others realize their purpose and potential. For the last 10 years, Carolyn has fine-tuned a comprehensive, interactive online program called Mastering My Present Moment Project, an initiative that focuses on significant life issues that block us from manifesting our heart’s desire. She has been the president of the worldwide organization Repatterning Practitioners Association since 2004. When she is not working with clients on a one-on-one basis, she and her peers offer a weekly online group proxy session called the World Peace Hologram. Carolyn makes her home in Toronto, Canada. Carolyn, What a wonderful description of your work and more importantly, your personal characteristics. In my adult life, you have always been there when I needed support and a “little push” to encourage me to step out of my comfort-zone and try something new. You even have me “blogging”, something I had never considered as an activity or a way to make new acquaintances! Thank you for helping me yet again to experience life in a different way than before. Would you please send me the link with instructions on how to get to your notes for Sept.22, 2010 Fall Equinox Resonance Repatterning Notes and / or Audio Recording. Hi There – notes are being edited and hopefully online later today or first thing tomorrow. I will send an email to the Energize! group when they are ready and make a post here as well. It was a very interesting session where we cleared our resonance with world patterns for the economy and trauma from the economic melt down. Who knows, maybe our session has created jobs for the world at large! Hi – the notes are now just online. Email coming out later. Here is the link: http://www.lighttravels.org/energize/September22.asp – cheers!